I was kindly asked to write a piece for my friend Kate Hamilton at mourningcross.com I thought I’d share with all. When my daughter Órla was diagnosed with a terminal illness aged 7 years my world was turned upside down. A very quick 24 months later and I knew I was spending the last summer with my precious baby. During those last few weeks I thought a lot about her funeral, in fact I could think about nothing else, I needed to plan and organise and keep my mind busy. I researched palliative care and what to expect. I choose songs that I wanted played during her funeral. I decided what she would wear & which favourite items would go in her coffin. It then came to the choice of coffin. I had buried my father two months previous to Órla and looking at choices available I desperately needed a sign from him that this was ‘the one’ he would want but alas they all appeared cold, dark and melancholy. In the end we choose one that was named Stanley the name of the company my father had worked for most of his life. When it came to Órla I wanted to be prepared, I wanted her final resting place to be quirky and funny just like my little girl. I wanted pretty & girly not dark woods and cold brass handles. I wanted something very personal so that her last send off was about me & her and no one else. It seems that a lot of people are feeling the same way and the variety of different coffins available have increased immensely in the last few years. We have wicker, wool, bamboo to mention a few and then there’s the Eco coffins and cardboard variety. It was whilst browsing I noticed a ‘decorate yourself’ cardboard coffin. I knew straight away that this was what I was looking for, it couldn’t get anymore personalised. When the day came that Órla passed I was dreading the coffin arriving, I wasn’t ready for her to leave her bed, her room. The coffin was placed on wheels in my kitchen, suddenly the blank white box I choose seemed like a mammoth task that I had to undertake when I was at my lowest. When we were all at our lowest but it had to be done, so we began drawing, painting, sticking. What I never imagined was how therapeutic and calming it was. 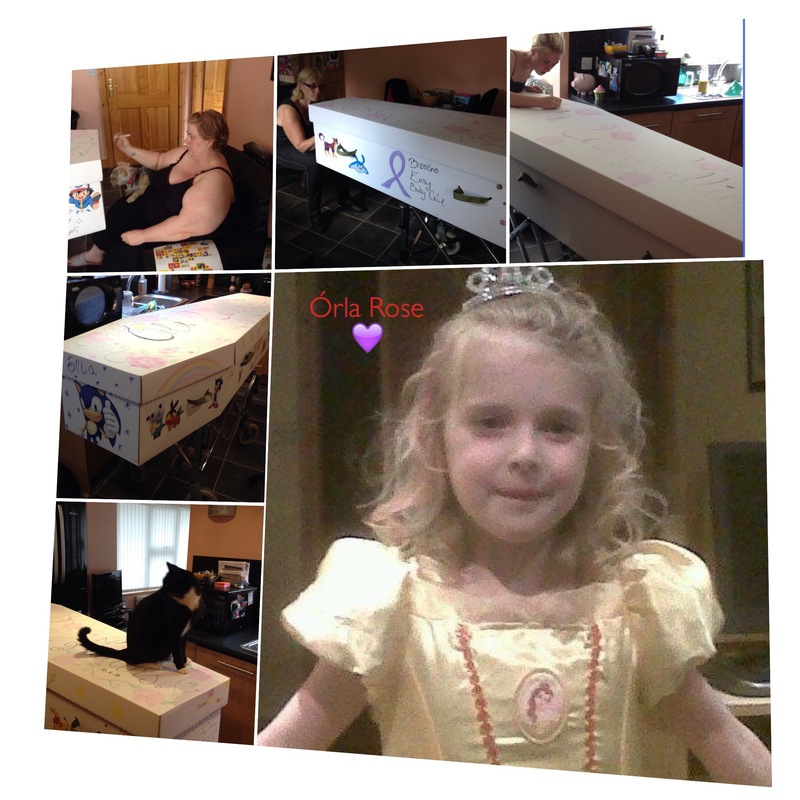 All three of us put Órla’s favourite characters, pictures and sayings around the sides of the coffin. Our two cats meanwhile climbed on top and inside also wanting to be part of it. We played loud music that Órla loved, we reminisced about the past, we laughed, we cried, we drank and we even danced over the following 24 hours in our kitchen in between popping in to see Órla in her bed in the next room. By the time her carriage was ready (we no longer saw it as a coffin) we were ready to say goodbye to our beautiful girl. All three of us felt we did her proud. Órla had no big funeral, no traditional wake just very immediate family. She was a very special girl and never liked people around her so our work was not to be paraded about but then that was never our intention, we just wanted a more personal resting place but what we ended up with was an amazing experience that we shall never forget.